I did a quick search but didnt find what I was looking for so I thought I would ask here. What do you guys recommend for a decent airgun scope with an upper price limit around $200? I would like it to be something that will stand up to use on a spring piston gun and it may also see some use on a .223 powder burner. AO would be a nice touch but not a requirement. I have several "cheap" scopes at the moment such as a leapers golden image mini 4x32 mildot , Simmons AO 3-9 22MAG, and a center point 4x32 and am hoping to up the game a bit without breaking the bank. All suggestions welcome. I have not tried the Simmons on an airgun yet but it does say its airgun rated does anyone have experience with it on a Springer? i’d suggest a Hawke Airmax 2-7x32($230) or 3-9x40 ($240), both are parallax adjustable and the Airmax line is springer rated. They’re more than your budget but good glass is worth the price. Also it might help to know what kind of power your looking for and what you’re mounting it on. Talk to wesb2007 and see if the discovery vt-1 3-9x40ao is springer rated and his thoughts on it. I can’t comment on discovery scopes yet, I have one but haven’t been able to look at it yet. I heard the Simmons were hit or miss. I know a friend, his has a mind of it's own on a 22LR. I picked up a Nikkon Sterling Mountmaster for under 100$ and seemed to fair well on a springer. I've used Simmons 6.5-20X44's on field rat rifles for going on 16 years without any troubles at all - on .222, .22-250's, .17 Rems, .17Ackley Bee .218 Ackley Bee and .17 Ackley Hornet as well as a 6-18X Simon's Pro Hunter on my 10-22 Ruger. So - likely 10,000 .22's and 20,000 other centre fire rifles. What the new ones are like, I have no idea, however, 10 years ago, I gave a friend a 3-9x40mm Simmons camo hunter model for his retirement and his son is still using it on his 7mm/08. Etched on glass reticle - with 1/2 mil-dot slashes and mil dots as well. The Discovery VT1 3-9x40 is springer rated, for $100 and ao with a half mil dot reticle. The VT-2 4.5-18X44SFVF is a nice scope for around $150 and a side focus ao, also springer rated. It is not compact though. 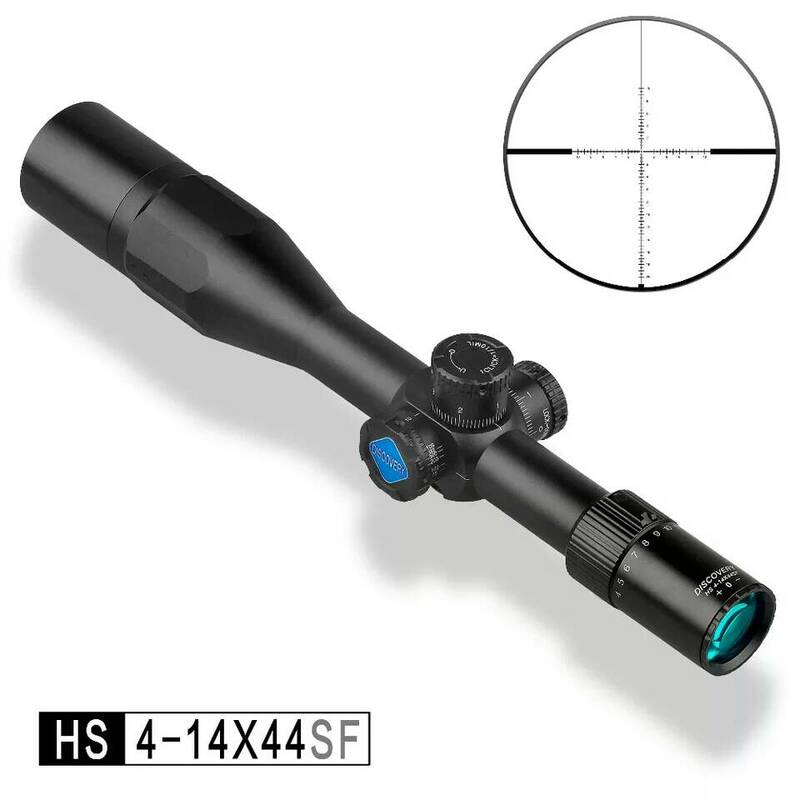 Out of the Discovery scopes I have, the HS 4-14x44 FFP is probably my favorite for a hunting scope. It's light, compact, 30mm tube, super bright and has a great first focal plane reticle. It's $250 shipped. Also comes with a sunshade and some really nice 11mm or Picatinny mounts. Here's a pic of it with the sunshade attached. Right now I'm looking for a scope to replace the centerpoint 4x32 on my full power diana 24 ( still pretty low power) but as I mentioned I would like to be able to use it on firearms as well and will likely be looking at higher power springers in the not too distant future. The discovery scopes mentioned above intrigue me but I've never heard of them before are there reviews available somewhere online? Has anyone here used the models mentioned? I haven’t found many reviews, there’s a couple on gta. I’ve got one of the HS 4-14x44 SF’s waiting for me at home but I won’t be able to look at it until tomorrow night or Saturday. When I get a chance I’ll do a review on it, it’s going up against a Hawke Sidewinder 30 10x42 so it’ll be interesting. Go into the dealer forum and look up wesb2007. Lots of comments there about these scopes, and Wes will give you the straight poop - he sells them. Ooops, he's already responded here. Send him a PM. For those looking for an moa scope I've got some coming as well. Just thought I'd mention that. As far as reviews if you look up discovery scopes on YouTube you'll find a bunch of torture test reviews of different models. Also the GTA forum and airgunnation have some good reviews. I've been using the Legend 5-15x40 scope offered on the CAF store at $190 for years on my HW77. Nice clear bright scope with good eye relief and its been completely trouble free.